It was the spring of 1969. I was a teenager, interested in all the things teenage girls are interested in: boys, clothes, boys, jewelry, boys…. My sister, Rose, was 30-ish, having been a teenager when I was born. Too bad the photo is damaged with age. 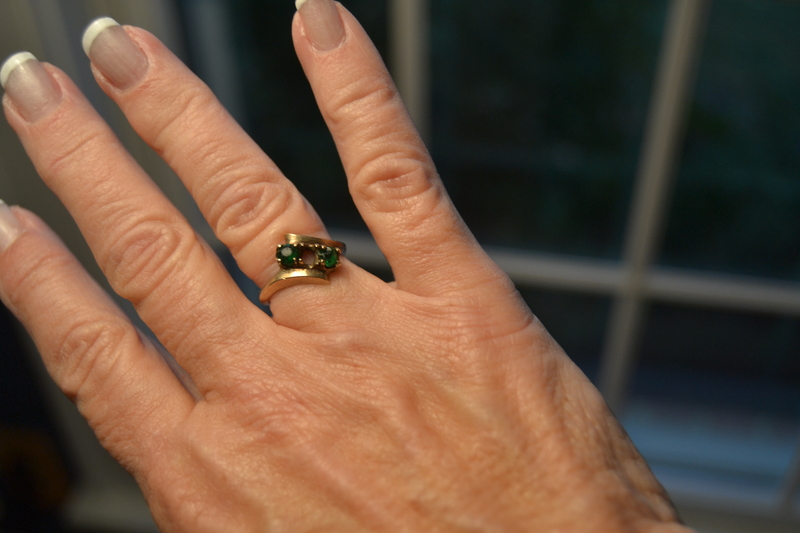 That spring, she loaned me her birthstone (emerald) ring to wear. Its financial value probably wasn’t all that great, but it was a treasure to me. The evening of April 15, I happened to notice that the middle stone was missing. I told Mom that I was afraid Rose would be so upset with me for losing a stone out of her ring. A few days later, my Mom made the observation that it was the night Rose was killed that we discovered the middle stone was gone from her ring. And Rose was Mama’s “middle” daughter. While I was taking pictures of it for this post, I tried it on for the first time in many, many years. This entry was posted in Family and tagged emerald birthstone ring. Bookmark the permalink. I’m so sorry for the loss of your sister through violence. I know the ring which was borrowed, became a lasting gift from her. Yes, Georgette, I’m glad to still have that little ring. So very sad…..but it’s a lovely photo of two loving sisters and that ring is spectacular JUST the way it is….the middle sister and middle stone gone but never, ever forgotten. Thanks, Pam…glad my mom snapped that picture of Rose and me (not sure why she did though!). This is a sad, terrible story, but I’m so glad you have the ring to remember her by. I love the picture of you two. I’ve never seen this picture before and I hadn’t heard the story of the ring. I wouldn’t have known it was the two of you….sure doesn’t look like either of you. Thank you for sharing such a tragic story with us. 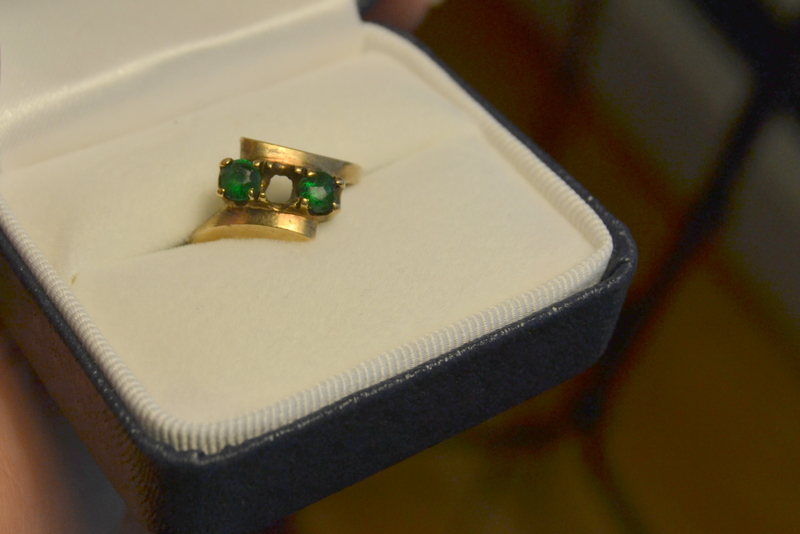 Items such as a missing stone in a ring can hold so much meaning even for being measurably small. My heart goes to you. Dianna I clicked over when I saw your blog in my inbox but when I read the post I needed some time to think. Shocked me about Rose. I am so sorry that happened to her and your family. I can’t imagine. The ring certainly holds a special place in your heart the way it is. The picture of the two of you is laughing is sweet. 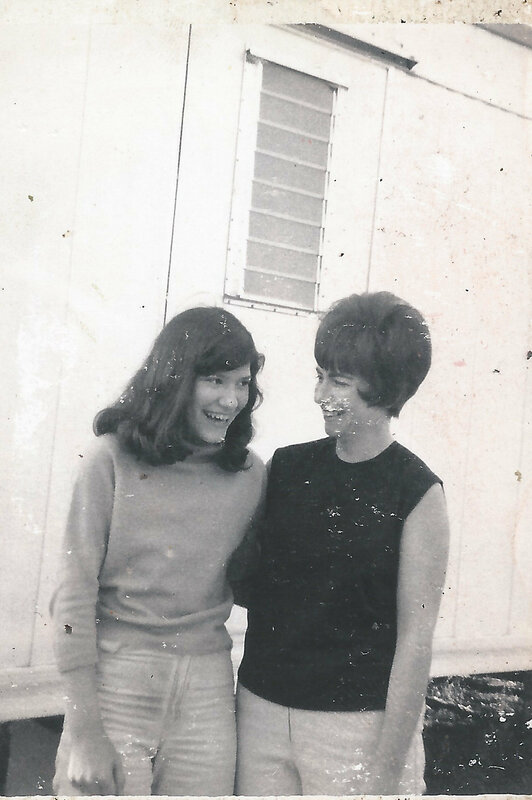 We didn’t take many pictures in those days, and I’m not sure why Mom took that one of us, but I’m glad she did. It’s probably the last picture taken of us together. *two of you laughing… no “is”. Despite the tragic ending you have such sweet memories, and I love the picture of both of you. I remember the long hair. Isn’t it something that just a small token can represent our stories so well? Even though the horror of losing your sister to domestic violence is very tragic and I can’t even imagine the sorrow you all went through, the love and wonderful memories of her will stay with you for a lifetime. That ring is a special gift from your sister. And it’s obvious you treasure it like you treasured your dear Rose. Thanks, Mama. When I saw the prompt for the word “ring”, I knew what my post would be. oh, bless you. what a horror… and a hole in your heart forever. What a sad story but so glad you have her ring to remember her. You should wear it often…just like it is. Such a sad but profound story. The ring is perfect now and how awesome that it still fits!! A lovely picture!! Thanks for visiting, Debbie. It’s a special reminder of her. I love the picture of you two together, what a treasure. I think the stone missing was a sign. Hubbs also had a brother murdered; can’t write about it, it’s just too fresh, even after 20+ years. But my heart hurts for all you’ve lost. Oh, MJ, I’m so sorry to learn about your husband’s brother. Please pass along my sympathy to him. What an awesome story Dianna! A terrible tragedy and a memento with so much meaning. Yes, Dor, it was a sad time. And, to make it even worse, my mom lost her mother about 6 months later. Rough year. I had forgotten about your sister, Rose. This is a lovely story about your treasured memento. I wouldn’t have the heart to replace the stone, either. Thanks, Patti, I’m glad I’ve kept up with that little ring all these years. Oh wow, I had no idea you had lost a Sister, I can’t imagine. What a treasure you have with her ring, I agree I wouldn’t have it replaced either. I hope you don’t mind my saying, what eerie coincidences surrounding her loss! My love to you my friend, as I’m still learning the hurt never leaves, we just learn to live with it. I REALLY hope you won’t mind my asking this but I can’t help but to ask. What became of her former husband? Naturally he was held accountable?? What an awful tragedy! I can’t imagine what that experience of losing a sister in such a violent way must feel like for you. I absolutely believe that ring and missing stone was a message straight from Rose. She’s safe now, what a blessing to have received that. Thanks, Kat…yes, there does seem to have been a message there. Thanks for hosting the workshop each week; although I don’t always participate, it’s fun when I do!